A missionary: "At Christmas the 'low profile' of Jesus, beyond the power of numbers"
The Director of the PMS: "Towards new elections: young people demand democracy and freedom"
Bangkok (Agenzia Fides) - Almost 350 years have passed since the first Catholic mission in Siam began: to commemorate the imminent anniversary of the Apostolic Vicariate of Siam (Mission of Siam: 1669-2019), the Bishops' Conference of Thailand organized a celebration at Chiang Rai Rajabhat University, in Chiang Rai province, northern Thailand, which took place on July 7th. 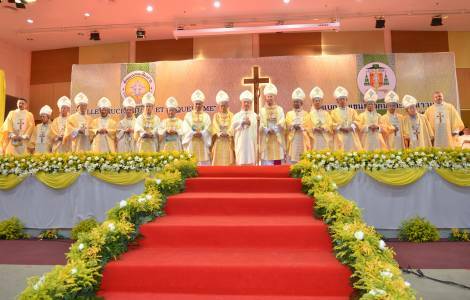 During the celebration two other events were recalled: the creation of the new diocese of Chiang Rai, officially erected by the Holy See on April 25, 2018, and the episcopal ordination of the Bishop-elect Joseph Vuthilert Haelom. As Fides learns, over 8,000 faithful took part in this important occasion, in the presence of 2 Thai Cardinals, many Bishops of Thailand, Malaysia, and Laos, and of the Apostolic Nuncio to Thailand. "These are milestones in the history of the Catholic Church in Thailand, which indicate considerable progress in evangelization", notes the local Church. Representatives of other Christian confessions and Buddhist religious leaders, Sikhs, Hindus and Muslims participated. The commemoration of the 350th anniversary of the Vicariate of Siam is the response of the local Church to the Apostolic Letter "Maximum Illud" (1919), which will shortly mark its 100th anniversary, and shows the efforts to implement the 2015 Plenary Council Decree for the launch of a special campaign for the "missio ad gentes". The first seeds of the Gospel were sown in the Kingdom of Siam (now Thailand) in 1544, more than 450 years ago. In 2015, the local Church celebrated the 50th anniversary of the erection of two Christian communities to archdiocese, namely Bangkok and Thare-Nongseng. In the last fifty years, eight new dioceses have been created: Chanthaburi, Ratchaburi, Chiang Mai, Ubon Ratchathani, Udon Thani, Nakhon Ratchasima, Surat Thani and Nakhon Sawan.